“NOTHING TO FEAR BUT FEAR ITSELF”. I sometimes find it hard to believe that this saying only dates back to 1933. Surely this saying must have been around since the dawn of civilization. If it wasn’t, people must have known it as a truism. This is probably the least contentious statement ever said. It affirms what we already know to be true. The meaning we take is usually that it is better not to live in fear of something happening as it may not actually happen. That fear is an inhibitor and stops us fulfilling our potential and reaching our goals. “NOTHING TO FEAR BUT FEAR ITSELF”. So said Franklin D Roosevelt on his inaugural speech in 1933. These were prescient words because a culture of fear grew to be pervasive in society with the rise of fascism in Europe, Stalin’s purges in Russia, and Japanese imperialism terrorizing millions in the east. In the 1930s and 40’s, there was a decline in personal freedom, and a creeping rise of a totalitarian society. Competing ideologies and nationalistic values dominated in such a way that the individual’s beliefs became almost irrelevant. Propaganda was everywhere. Atrocities were pinned on the dissident groups and outsiders. False Flag events were committed to stir up hatred and then direct it against the nation’s enemies. Individuality and expressionism were suppressed if they did not confirm. People did not openly judge what they were told and most accepted their station in life and changed their ambition to do their duty instead. The people were told who their enemies were. Scapegoats were chosen, and public witch hunts ensued. This is what we call a climate of fear. It is when fear has reached a pandemic level and has began to permeate most people’s subconscious so that society allows itself to be led and controlled by anyone who convinces them that they can control and limit the fear. These times usually signify lapses in morality, acceptance for the need of sacrifice, and a colder hearted acceptance of death. So introducing fear into society, allows the State to manipulate and control a much more obedient and docile population. It is a wonder that governments do not take advantage of this tool of control and keep their citizens in a permanent state of ongoing fear. Perhaps it is because that wouldn’t work in practise. The subjugated often overthrow their oppressors in history and slaves gain their freedom. Maybe fear is a more effective tool of control when it is used more subtly and allowed to permeate from the subconscious to the unconscious minds of people. To achieve this, the controller would have to build a society that continually had to deal with a range of different threats. Some that are subtle, some that are overt, some that are imminent but can be overcome, and some that are long term and remote but which do not go away. If individuals can be controlled by fear, then it probably applies that an individual can control and subjugate his whole psyche and maybe even his fate through holding on to fears. Thus before fear can be dealt with in society, we need to take a closer look at it at the individual level. “The enemy is fear. We think it is hate, but it is fear”. So said Ghandi, who recognised fear as the worst human condition and its most exploited weakness. In humans, fear is not just an instinctive gut feeling but it is a complex all encompassing emotional state. It is complex because it takes information from the senses, thought patterns, reasoning and intuition and combines them with memories and imagination to anchor the present to the past and the future. I will explain this later. Fear can be a response to a danger, real or perceived, large or small. It is how we manage it, that either leaves us feeling in control, or else controlled by our fears. When fear controls us, we tend to both exaggerate it and emphasize it in four different areas. The Unknown gives rise to the ‘What if’ fear. The imagination induces us to catastrophize. Fear of what we cannot control tends to limit and restrict us. Anxiety is the product of our self critical feelings about our lack of courage or inability to confront something. The fears we don’t confront, we often ignore or suppress. We are taught to ignore them since childhood. “Don’t be silly, it is nothing to be scared of” or “you are making a mountain out of a molehill”. As a child when we take this advice we are actually suppressing these fears, and not dealing with them. We act coldly and unforgiving to ourselves for our weakness. However we often find something to comfort us. Over the years , our inability to deal with certain fears means that we grow to rely more heavily on those things that we turn to comfort us and make us feel better about our inaction. The English language maybe has more words to express fear than the Eskimos have to describe snow. Agitation, Fright, Alarm, and Terror describe the condition of fear in a present happening state. 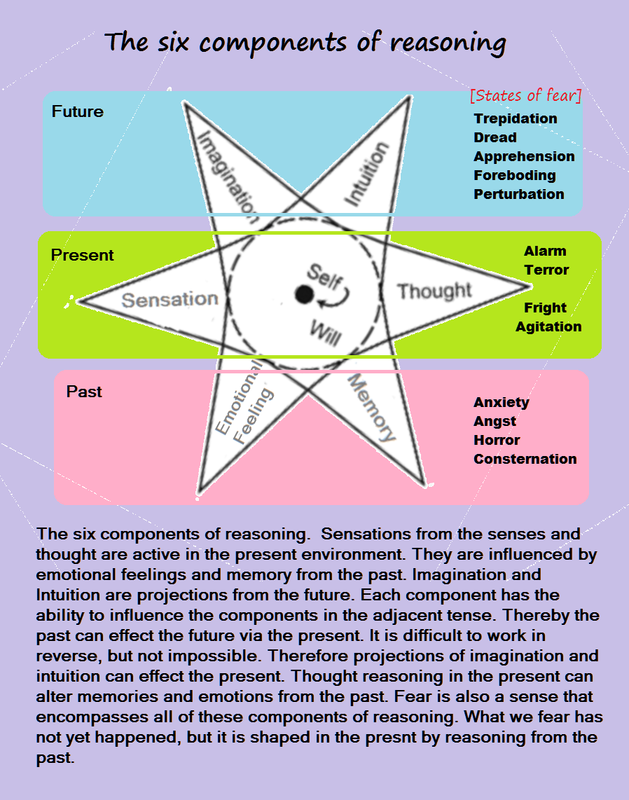 Anxiety, Consternation, and Angst describe how our feelings have processed past bouts of fear. However by far, the lion’s portion of words describing fear, belong to a future state. Examples are Apprehension, Dread, Trepidation, Perturbation, and Foreboding. There are too many to list here. They imply that Fear resides in the future. My mother explained to me that this saying had a deeper meaning as well. That was that if you really feared something, your fear might actually attract that something to materialise in your life. It is strange how many people accept this meaning as well. “Don’t think about it .. It may never happen”. That is a common piece of advice I have heard down through the years. There seems to be some universal belief that we can manifest bad events just by thinking about them. However we can protect ourselves simply by not thinking about them. This however pushes the fear down to the subconscious level. The fear still remains. How come we believe that your worst fear might come true more likely than you can get what you wish for. 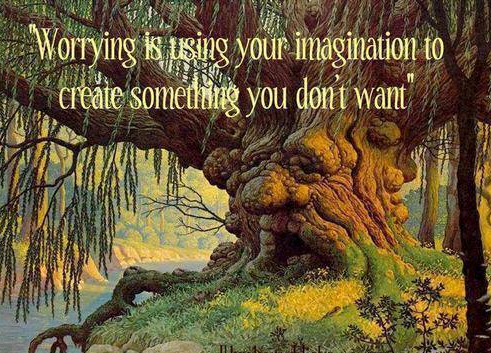 I always found it strange that we don’t hold the same conviction about manifesting something good in our lives. That is wishful thinking that is likely to disappoint or misdirect your efforts. Positive thinking and a positive attitude is good, but it society tells you to accept its limitations and prepare for disappointment. I guess they are saying that it doesn’t really work that well. Fear on the other hand is very potent and should be handled with care. Making wishes is dangerous business; Aesop’s fables seem to warn us. You can wish for the most wonderful thing in the world and the powers that be will twist it against you. Fairies’ gold turned to dry leaves in the morning light. This is very cautionary advice. It seems to warn us from positively wishing for something in case that something manifests and bites us on the bum. Taken another way, though, this proverb is actually excellent advice. Instead of a dour caution, we see it as a challenge to dig deep into your heart, to what you really want. You get what your heart desires. Here we have another double meaning. 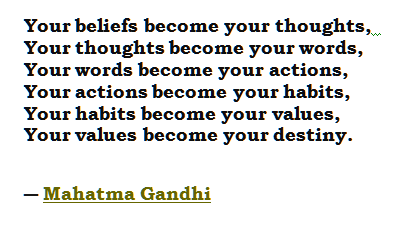 The first explicit meaning is you are more likely to manifest that which you truly desire. The implicit meaning is that it is not the wish that you ‘think’ that can manifest into a reality, but instead it is your heart’s desire. This defines that only an emotional desire that is held strongly in your heart has the power to come to fruition. It is questionable whether any thought can actually manifest into reality in the same way. If they can, it is likely only those thoughts which are emotionally charged and have morphed into emotional fears or wishes. However, in order to manifest ‘a heart’s desire’ you have to nurture that desire as if it is a newborn without any ability to survive without your constant attention and care. You need to continually strive to put in place the environment in which it can grow up and ‘find its own legs’. Even with this knowledge, the emotional heartfelt desires are not always able to manifest. In fact, it would appear that emotional fears can more likely manifest into reality. Why is this? Perhaps this can be explained by the realisation that fear is a very strong emotion that is naturally held by all of us. Those emotional fears that we do not tackle and master tend to repeat throughout our life. They may become or were already part of a karmic lesson. Throughout our life, each of us tends to get an individually tailored set of karmic lessons which repeat for us through different scenarios with different people until we finally master or understand the lesson. It is not always easy to recognise what specific karmic lessons are represented by our various challenges in life. Because they are subjective, it is often easier for those close to us to recognise our own failure in mastering the pattern of repeating challenges and problems over the years. We can be blind to recognising our own faults and failings. We can analyse the failures in our life only with hindsight and of course regret. However we do eventually become aware that we can make the same mistakes over again. These mistakes are usually where we take inappropriate action or even repeated inaction to deal with a situation which challenges our emotional comfort zone. We all make errors. That is only human. However if we fail to correct an error, then it becomes a mistake. It often seems easier to repeat our mistakes over and over again in order to find some short term solace or quick reward. The reward is that we have made the fear of doing something which is uncomfortable to us go away. Sometimes it can simply be the laziness to deal with a situation. There is always a part of us that remains aware of the inappropriateness of our action and the possible consequences that might manifest later on. This is an emotional fear that sits uneasily in our heart. Our imagination fuels this fear. That is to say ‘in the back of our mind’ we envisage a future reality that we fear manifesting. This is our subconscious realising a possible future consequence of our inappropriate choice, action/inaction or decision. Our higher self is communicating with us through our subconscious and is trying to guide us to remedy the situation or at least recognise our mistake. Instead our conscious self sees a fear which it doesn’t like and chooses to file it away in the ‘back of our mind’. Over time, we might see this fear manifest itself into a realistic potential outcome. We recognise a fear coming to life instead of just an inevitable development from our karmic mistake. Then we fear this development investing an emotional charge in it which will help nurture it from a potential into a reality. With the karmic lesson unlearnt, the circumstances which led to our initial inappropriate choice, action/inaction or decision will repeat again throughout our lives until we learn to ‘do the right thing’ which is more often not the easiest path to follow. Once the karmic cycle has been broken through following the appropriate path, this karmic lesson will not usually repeat itself in our life. We no longer feel that we are ‘doing the wrong thing’ , and so that potential bad feeling can no longer charge an emotional fear. There is no longer a karmic fear to manifest into reality. Your favorite justification seemed to be on the web the simplest thing to take into account of. people think about worries that they plainly don’t understand about. ← IS HUMANITY BEING QUARANTINED?